Magnificent, indeed. This collection appears to have been released in honor of La Caballé's seventieth birthday, and I hope collectors will avail themselves of the opportunity to hear why this soprano is not "just another pretty voice." Who, among today's sopranos, can compare to her? Montserrat Caballé was born in Barcelona in 1933. Her humble beginnings did not prevent her from studying at the Barcelona Conservatory, where she received excellent training, allowing her to make her first professional appearances in the 1950s. The year 1965 was a watershed: she replaced the indisposed Marilyn Horne in a Carnegie Hall performance of Donizetti's Lucrezia Borgia. From that point on, opera houses and record companies clamored for her, and they would do so for another two decades. Caballé is famous for her beautifully floated high notes, but there was more to her than that. In fact, she was an unusually versatile singer. Essentially a lyric soprano with coloratura (and later spinto) capabilities, she was at home in both Mozart and Richard Strauss, as well as in bel canto and verismo. The Così arias are stylish, and Mozart's showiest passages are delivered with clean agility and musicality. The arias from Louise and Les Huguenots are warm and charming. (I don't think the 1970 recital LP from which these are taken has been transferred to CD completely.) Her pioneering recordings of early Verdi with Lamberto Gardelli are represented by Il Corsaro and I masnadieri, as is her Rossini rarity Elisabetta – which finds the English queen singing a melody we associate with Rosina from The Barber of Seville! Liù from Turandot was a happy excursion into verismo, subsequently extended with an excellent Tosca from four years later. The 1976 Lucia is anything but mindless coloratura; Caballé, using lower keys (sanctioned by the composer) creates a darker heroine (albeit brilliantly sung) than we are accustomed to. As Caballé grew older, she took on heavier roles. La Gioconda from 1980 is another highpoint; her Andrea Chénier from a few years later, however, is vocally wobbly, although no one will accuse Caballé of approaching Maddalena timidly. 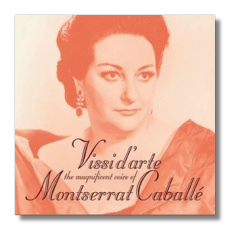 In the 1960s, Caballé recorded Norma for RCA Victor; in 1984, she took on Adalgisa to Joan Sutherland's Norma. This recording was something of a swansong for the two divas, and although they both sound a little long in the tooth for these roles, magic happens and the years roll back. The scene from Salome (recorded in 1977) might seem uncharacteristic, but Caballé (with Leonard Bernstein) is fantastic here, and this was a role she recorded in toto in the 1960s with Erich Leinsdorf. Although this is a Decca release, recordings from the Philips and Deutsche Grammophon labels are included here as well. Caballé was a prolific recording artist – in the 1960s, she recorded for RCA Victor, and in the 1970s she also recorded for EMI and CBS - so in no way should the present compilation be considered wholly representative of Caballé's career. Nevertheless, Decca's team has done a fine job of compiling material available to them, and I can't imagine fans of this soprano disliking what they will find here. My only reservation (a minor one), is that some selections (the Love Duet from Ballo, for example), are trimmed too much, and that quick fade-outs, where they are used, leave one hanging. I suppose that just gives me a reason to go back to the complete recordings! No texts and translations are provided, but there is a nice appreciation of the singer by Pedro González Mira. Now, while I have Universal Classics' attention, a reissue of the soprano's Madama Butterfly recording from the 1970s would not be unwelcome!